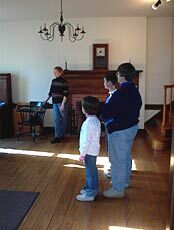 [JAN. 20, 2003] Following the early retirement of site director Richard Schachtsiek at the end of December, both the Postville and Mount Pulaski Courthouse State Historic Sites are keeping regular hours, staffed by volunteers. Shirley Bartelmay of Lincoln, scheduler for the Postville volunteers, said she has all January slots filled but one. The site is open noon to 4 p.m., Tuesday through Saturday. Schachtsiek had manned the site on Fridays and Saturdays before his retirement. He will be missed. Thressia Usherwood, executive director of Abraham Lincoln Tourism Bureau of Logan County, said Schachtsiek was "wonderful to work with; very, very supportive; very tourism-minded"; and she added, "I'm going to miss him terribly." "Oh, he was great because he helped with everything," Bartelmay agreed. She explained that Schachtsiek knew the answers to a great variety of questions and was "an excellent training person." A volunteer herself, Bartelmay conducted a training session for three new volunteers recently, using materials compiled by Schachtsiek. Those trained were Judy Alberts, Stuart Churchill and Ruthetta Getchel, all of Lincoln. Two others are in line for orientation in the near future. Bartelmay said the 32 volunteers already in place "really stepped forward" and were very cooperative about helping to fill the void left by Schachtsiek's departure. The volunteers were organized in March 2000, and most of the first participants are still active. 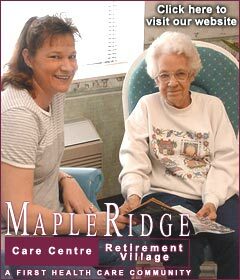 The corps comprises both retired and working people. Mount Pulaski Courthouse is being kept open the same hours, noon to 4 p.m., Tuesday through Saturday, by its corps of volunteers. In Mount Pulaski the city clerk's office handles the scheduling. Maintenance duties at both sites have been assigned to two New Salem workers. But Mount Pulaski is experiencing less change than Lincoln because Schachtsiek did not keep regular hours there; he came instead for special events. On Dec. 1, 1992, under threat of being closed by the state, the Mount Pulaski Courthouse became the only historic site in Illinois kept open entirely by volunteers. Schachtsiek supplied historical training for the volunteers, and Wally Kautz of Mount Pulaski acted as model for a day of on-the-job instruction. Kautz said the program has worked well, and he believes all the volunteers have enjoyed the experience. Schachtsiek trained two Mount Pulaski volunteers in December. Kautz surmised that, if new volunteers step forward before a site director is named, he will train them. There are currently just under 30 Mount Pulaski volunteers. Each works one day per month. Robert J. Coomer, superintendent of the Historic Sites Division of the Illinois Historic Preservation Agency, spoke to Postville volunteers in December. He has submitted a letter to his director requesting an exemption to fill the site director post. Ultimately, the decision will be made by the Illinois Bureau of the Budget. Coomer said he is optimistic that the position will be filled. If approved, it will take at least 60 days to post the opening and interview applicants. The state considers Postville Courthouse and Mount Pulaski Courthouse to be one site requiring one curator. Bartelmay said it is important to keep the courthouse sites open because of the tourists and dollars they draw to the county. Postville recorded 1,610 visitors in 2002, an increase from the previous year. If three-fourths of those visitors came from out of town, and they bought gas, food and other items and many stayed overnight, they spent over $100,000 in the county, she calculated. Records show that last year's Postville visitors came from 33 states and the District of Columbia plus 11 foreign countries. Asian tourists are especially intrigued by Abraham Lincoln and tend to be already well informed when they arrive, Bartelmay noted. 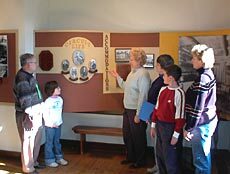 Volunteers at each site direct tourists to other area attractions, including Lincoln College Museum and Under the Prairie Frontier Archaeological Museum in Elkhart. [JAN. 20, 2003] FORSYTH -- Legislation co-sponsored by state Rep. Bill Mitchell, R-Forsyth, gives victims of crime or their survivors more input into whether or not a death row inmate deserves to have his or her sentence commuted and prevents future blanket commutations. "This is not a constitutional change," said Mitchell. "This bill puts in place guidelines or procedures that future governors must follow before making these critical life-or-death decisions -- with the hope being that they give prosecutors and victims an opportunity to voice their opinions before making a final decision." * Preventing the governor from granting clemency without a full hearing and report from the Prison Review Board. * Requiring the Prison Review Board to notify the victim of the crime and the state's attorney prior to any hearing on a petition for clemency. * Requiring the Prison Review Board to conduct a comprehensive hearing on the merits of each petition including materials submitted by victims and survivors. * Requiring the board to submit an open report to the governor for his consideration. "We all agree that we need to look at our death penalty system in Illinois. No one wants to execute an innocent person. However, it is apparent that Governor George Ryan abused his constitutional authority, and we must also reform the way executive pardons and commutations decisions are made," said Mitchell.